how to erase a decade of lies? After years on the run with her mom, Callie is suddenly taken to Tarpon Springs to live with her dad and his new family, plus their extended Greek family and uncomfortable truths which she can’t share (but Alex keeps worrying). Check your favorite local library or independent bookstore to discover the rest of this tough and fragile 17 year old’s story (and meet handsome guy Alex, too). How far should we go to keep secrets when the truth is more dangerous? p.s. No affiliate links *ever* on BooksYALove! 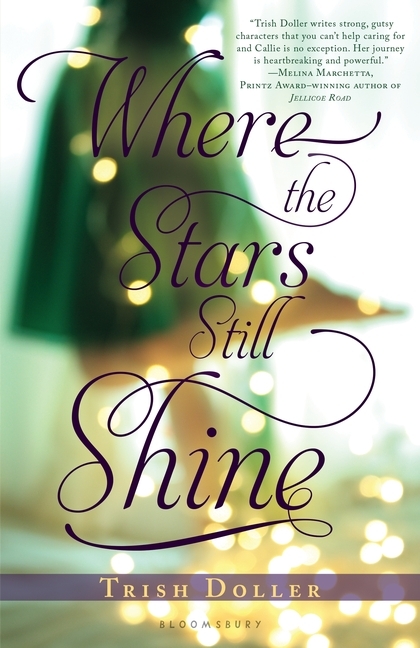 Book info: Where the Stars Still Shine / Trish Doller. Bloomsbury Children’s Books, 2013. [author site] [publisher site] Review copy and cover image courtesy of the publisher. My book talk: Returned to her family 12 years after being kidnapped by her mom, Callie has to learn how to love them and herself, even after what happened to her on the road. I didn’t know if I should’ve picked this up or not, but now I definitely will because it sounds awesome!